The Nokia X1-00 is basically a cell phone with a candy bar design. It is a basic entry-level device with a limited feature set. There are two things about the Nokia X1-00 that will make you wish you had one. The first being the really low price and the second being the loud speakers that it has. It is mainly aimed at people who find themselves in crowded or noisy places. The Nokia X1-00 offers a really good speaker and loud speaker so that the next time that you get a call you don't have to search for the key that increases the phone's volume or try to find a silent alley just to listen what the person on the other end is saying. You can also listen to your favorite music in the midst of a crowd, to your heart's content, without having to put the phone close to your ear to hear the song that it is playing. The Nokia X1-00 sports a 1.8 inch TFT screen and is capable of displaying 65,536 different colors at a resolution of 128 x 160 pixels. The dimensions of the X1-00 are 112.2 x 47.3 x 16mm and it weighs just 91 grams. A really light phone but with a big and attractive display and speakers to match. It comes in three body colors – gray, orange and blue. There are three keys dedicated to the music player and one nifty playlist creator key so you should not have any trouble playing the music that you have stored and organizing it into playlists. The main attraction of the Nokia X1-00 is the huge speaker on the back of the phone that is sure to catch everyone's eye. There is also a 3.5mm audio jack for speakers or headphones. The bright colors that the phone comes in only add to its attractiveness. The user interface is the entry level Series 30 interface. The fonts are large and clearly readable and if you have been using a Nokia, you will not have any trouble navigating the Nokia X1-00 user interface. 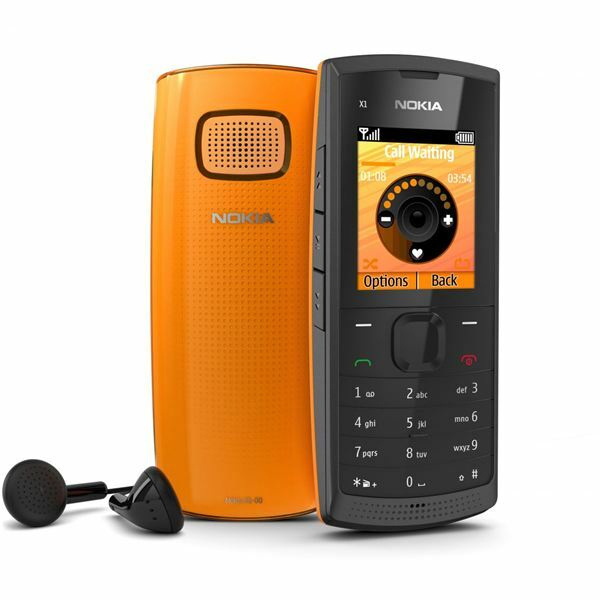 Even if you have not been using a Nokia, the user interface is so neat and simple, you will take pleasure in using it and you are unlikely to have to go through the user guide because you do not know how to use a feature or go to a particular menu. The whole thing is pretty intuitive. The music app is so easy to use (and so are the other apps) that you won't have trouble organizing and creating playlists of your favorite songs. Camera, EDGE, Bluetooth and GPS are some of the features that the Nokia X1-00 doesn't have. Given the really cheap price at which it is offered, it should be apparent that it will be stocked with just the basic features like sending and receiving texts, making and receiving calls, contacts list, clock, calendar, pre-loaded games and so forth. The Nokia X1-00 also sports a flashlight option. The outstanding feature comes in the form of the really loud and clear speakers. The speakers have been tuned in such a way that the clarity of the audio is not compromised even at maximum volume, unlike other cell phones that start producing extra noises and vibrations at such high volume. You have to give it a try to see how good (and how loud!) the X1-00 is when you listen to the songs that you have stored or on the FM radio. With support for up to 16GB expandable memory you can carry hundreds of songs with your X1-00. Another interesting feature of the Nokia X1-00 is that it has five phone books! Yeah, five phone books! That is because each member in your family can have one phone book for themselves. Although the phone is really cheap for people in the west, there are many countries where owning a cell phone is still considered a luxury. In such cases when one shares the phone among various members of the family, each one can be satisfied with their own phone book. A rating of four out of five has been given to this phone because of the number of features that it offers for its price and its class of cell phone. So please do not consider it to have the plethora of features that the smartphones are offering these days. As you already know, the Nokia X1-00 is a basic entry level phone and since it is coming from a company that has been manufacturing cell phones for more than a decade now, entry level phones like the X1-00 perform very smoothly and have no hassles running any applications. The fine tuning of the speaker ensures that there is no compromise when it comes to sound quality. Nokia has claimed that the X1-00 can go up to 106phon (phon is a measure of perceived loudness). 106phon is loud enough that you'll need to shout to make yourself heard when the phone is at full volume so this device could serve as a portable music player to fill a whole room with tunes. The X1-00 has a stand-by time of 61 days! It gives an impressive music playback time of 38 hours on a single charge and you can keep talking continuously for up to 13 hours before the battery dies out. Does anything more need be explained about the battery life of the Nokia X1-00? It's great. 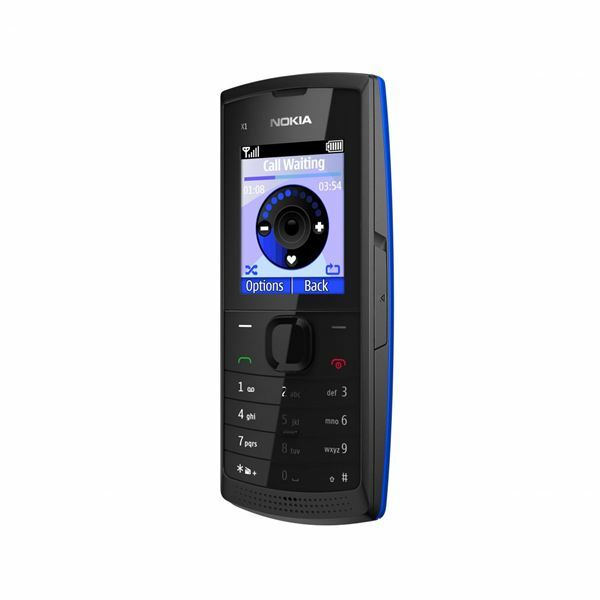 The price at which the phone is offered makes it the best value-for-money cell phone from Nokia that is currently available in the market. This entry level phone is recommended for music lovers and people who are about to buy a new cell phone for the first time but want the best for a really cheap price before moving on to cell phones better than this. It is also recommended for elderly people who have trouble hearing. You can also check out some alternatives in the best budget phones from Nokia or the top phones that Nokia has to offer.